Last year CPH Travel purchased a new boat, the Irrawaddy III. It is a spacious vessel equipped with twin 250 hp, 4 stroke engines. 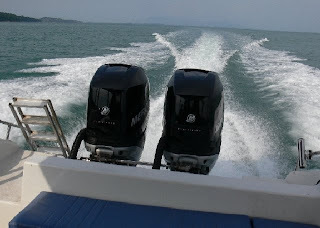 This makes it ideal for trips offshore and great for wildlife watching trips as the engines are a lot quieter than the 2 stroke engines that other local tour operators use. CPH use the boat for dive groups, deep sea fishing trips and wildlife tours. I’ve been meaning to go out on this fantastic boat for a while. On Wednesday I had the opportunity to take a trip on Irrawaddy III. The purpose of the trip was to look for dolphins in the Bako-Buntal Bay and a few offshore areas where the fishermen from Buntal often see dolphins. Jamadi, CPH’s boatman and keen eyed dolphin spotter, and Oscar from CPH joined our group. We left the Santubong Jetty at 9 am and in no time at all arrived at the Bako-Buntal bay. Conditions were perfect for dolphin spotting with a calm sea, good visibility and a perfect blue sky above. After cruising around the Bako-Buntal Bay we headed out to the deeper waters offshore from Pulau Lakei and then backtracked to the fishing grounds and shipwrecks north of Tanjung Sipang. Despite the perfect conditions we did not see any dolphins. We were hoping to spot some bottlenose dolphins but it wasn’t to be. So we headed towards Satang Island and then on to Pulau Tukong Ara or bird rock to view the terns and hopefully spot some pacific reef egrets. After a short while at bird rock we then headed towards the Santubong estuary and I spotted what looked like two dolphins splashing around on the surface. At first I thought they were Irrawaddy dolphins but they were tiny so I was a tad unsure. I was beginning to think that maybe I’d seen a turtle or a huge fish. Then they surfaced again and Oscar shouted “Finless Porpoises”. And sure enough to the side of the boat were a group of finless porpoises. The group were spread out and I estimate that they were a minimum of four individuals. They may well have been a whole lot more. Finless porpoises are very difficult to spot, they surface for a few seconds and the lack of dorsal fin makes it very difficult to track the group. After a 15-20 minutes we lost track of the group. Spotting the finless porpoises was a fantastic experience. Every time I head out to the waters off Santubong I am amazed by what is there. The area is such a beautiful place. I love being there but I also get the feeling that I am witnessing something that is about to disappear. More on that another day. Good to see you are back on the Blog. Having a boat moored at Santubong we are always on the lookout for dolphins though haven't spotted any for over a year now. However we do see a rapidly increasing number of tourist boats (of all shapes and sizes!). Hi Ian, this time of the year you are almost guaranteed to see Irrawaddys in the Santubong/Salak area. They sometimes come upriver to the Santubong bridge where the boat club is. There are a couple of yachts moored near the marine department jetty at Santubong village. I often see dolphins in this area close to the yachts. I am surprised you haven’t seen any for a year. Yeap, there are more and more tourist boats visiting Santubong for dolphin watching and trips to the Kuching Wetlands National Park. There also seems to be more traffic coming and going from the boat club. Maybe it is time for speed limit in the Santubong area. On the last few trips out we have spotted a number of dolphins with damaged dorsal fins, probably sustained as result of propeller strikes. Good news, we saw 2 dolphins yesterday evening around the boats. We have the only yacht moored permanently near the Marine fisheries jetty, the others are passing through. It will start to get busy in that area over the next few weeks with a lot of yachts heading over for the Rainforest Music festival. I think the yachts tend to be as much of a tourist attraction as the dolphins at times! I agree with your point that control of river trafic would be helpful and I would also add education of boat & jetski users in basic environmental awareness and courtesy towards other craft on the river. Hi Pesut - Glad to see your blog. I am a zoologist and wildlife conservationist from Canada who works primarily on the CITES treaty (including the Irriwady Dolphin issue, with my colleagues in the Whale and Dolphin Conservation Society, part of our Species Survival Network). My wife is from Kuching and we spend part of each year there. I would be very glad to get in touch with you as I will be in Kuching from about mid-January to mid-March and would very much like to see the dolphins and hear about conservation initiatives. Thanks! I'll be around when you are in Sarawak, email me at empesut@gmail.com so that we can arrange to meet up in Kuching when you are here.